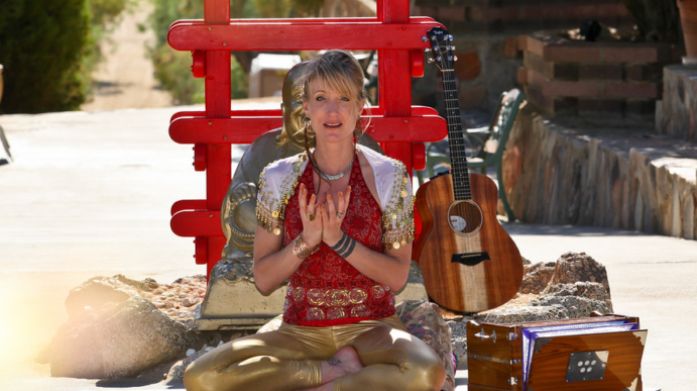 Johanna Beekman (RYT-500) is a multi-genre recording artist, sacred songstress, yoga teacher, and kirtan artist. She is loved for her rich, soulful voice, radiant spirit, and evocative, inspiring songs. Johanna’s devotional music springs from her roots in gospel, blue-eyed soul, and world music. Her introduction to the sacred art of chanting began at a young age with Krishna Das and Ram Dass. This has born fruit in recent years as she has dedicated her life to the path of yoga and chant. She created Lullaby Yoga™, a unique fusion of dreamy chants and restorative and yin yoga. She also offers world-inspired gospel-infused kirtan for top festivals, yoga studios, and churches across the country. Heart Beats One, Johanna’s critically acclaimed album of original kirtan music from the traditions of yoga, features guest appearances by Ben Leinbach, Benjy Wertheimer, Girish, Jaya Lakshmi, Ananda, Gina Sala, Daniel Paul, Hans Christian, Bibi McGill, and other esteemed members of the global kirtan community. The album, which was nominated as one of the top Conscious Music Albums of 2015 by Soul Traveler Radio, has been described by reviewers, musicians, and kirtan enthusiasts as stellar… stunning… gorgeous… beautiful… magical… mystical… sweet… healing… haunting… amazing… extraordinary…. It shines from beginning to end. Her new album, Beyond Love: Soothing Songs for the Soul, ventures even deeper into the heart space beyond love. Inspired by her beloved Lullaby Yoga classes, the album creates a sacred soundscape that’s ideal for gentle yoga, quiet chanting, meditation, deep rest, massage, acupuncture, therapeutic movement, and other healing modalities. Beyond Love was created with award-winning producer Ben Leinbach and features gorgeous guest appearances by Donna DeLory, Girish, Hans Christian, Lee Mirabal Harrington, Jared May, and Gawain Matthews. The track “Hey Ma Durga,” was nominated for Soul Traveller Radio’s Top 20 Conscious Music Songs of 2017, and “Hari Om” was included on White Swan Records’ Best Yoga Music of the Year playlist in 2017. The album has been described as a beautiful achievement… deeply healing… sublime… delicious… blissful goodness… a magical, musical experience… and more. Johanna has studied chanting with kirtan artists such as Gina Sala, Shantala, Jai Uttal, Krishna Das and Ram Dass; voice with renowned improvisational jazz singer Rhiannon and Grammy award-winning gospel artist Isaiah Jones Jr.; and songwriting with the mother of women’s music Chris Williamson. She holds a BS degree in Women’s Studies with a focus in improvisational and musical theater and is also a registered yoga teacher (RYT 500). Johanna’s more recent work includes collaborations with award-winning yoga teachers and artists such as Saul David Raye, Ben Leinbach, Govindas and Radha, Kia Miller, Sara Ivanhoe, Fantuzzi, Larissa Stow & The Shakti Tribe, Sianna Sherman, David Newman, and Dave Stringer. She has served at most of the leading Kirtan and Yoga and Wellness festivals across the nation, such as Bhakti and Shakti Fest and Beloved Sacred Art and Music Festival.